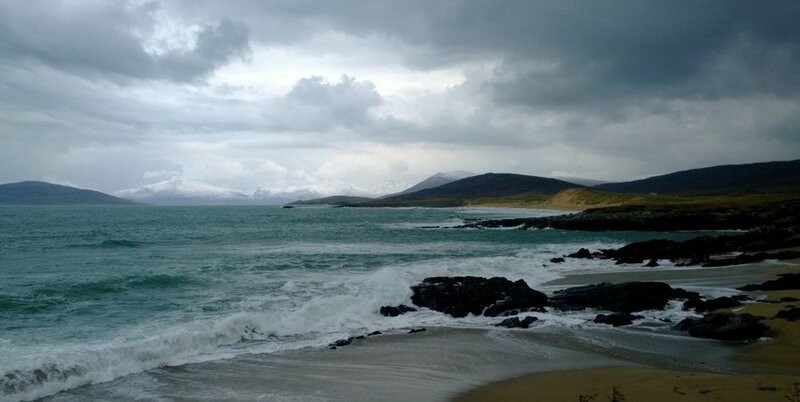 With the gales howling and the snows blizzarding, my challenge was to get the bathrooms onto Harris before the builders were left twiddling their thumbs...so, three cancelled ferries later, the van was loaded and off I went in fear and trepidation, with a two hour leeway in case the going got tough....which it did...Suffice it to say, I arrived with only minutes to spare! Such a relief to finally arrive at Sgarasta and be welcomed into the McSween's cosy bed and breakfast...and eventually to snuggle down in their electric blanketed bed. The next morning, kitted out in thermal leggings, two T-shirts, a jumper and two coats, fur-lined boots, fingerless gloves and a hat, I went up to see what progress had been made on the house since my last visit...and wasn't disappointed! 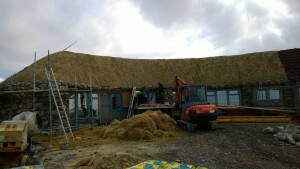 I have total admiration for the Hearach craftsmen who are transforming the soggy pile of marram grass on the ground into this beautiful roof, using the traditional skills passed down to them through the generations. This is only half of the house...the other half curves gently round the hill behind...so they've still got a long way to go! 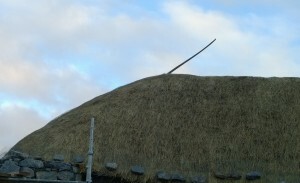 The grass is pushed into the upside down peat turfs, which have been laid diagonally on the roof. A net, anchored by stone weights, holds it all in place. The sister oar is at the other end of the house and together they anchor the rope net so that the whole construction can withstand the fearsome gales that will no doubt return each winter. 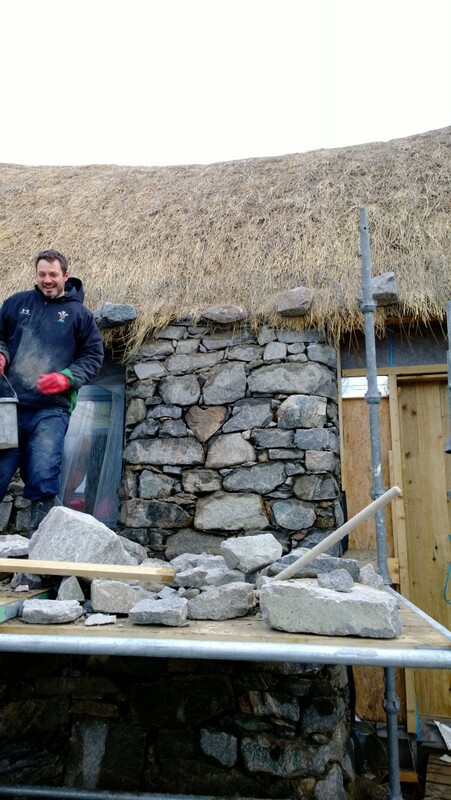 Another ancient island craft - dry-stone walling...and here is one of the trio of skilled masons, still smiling despite the Arctic conditions! The stone is Lewisian Gneiss, up to three billion years old, and blessed with an age-defying beauty and a variety of patterns and colours, which really come to life when the stone is wet. 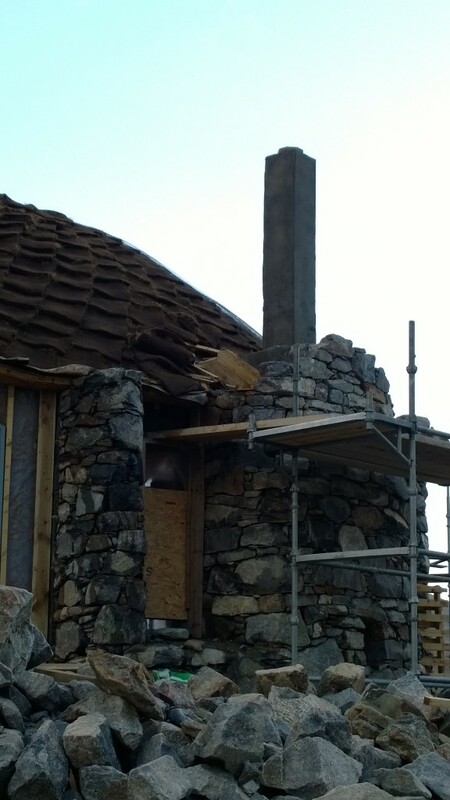 This is the chimney under construction: it encloses the flue which will come from a multi-fuel stove in the snug. Inside, the plasterboard is now going on - and every piece has its own angular or curved challenge to deal with, but the builders have the bit firmly between their teeth, clearly enjoying the sense that they are creating something completely unique. Much of the work, like all the necessary structural drawings and calculations that have been pouring out of Jonathan's office, will be sadly invisible when the house is finished - so let me take the opportunity to register my respect for this hidden work now, along with the trust and vision of our client, as it's a bit like knitting the most complicated Fair Isle and having to make up the pattern as you go! The day was spent going through each room and pouring over plans and drawings in minute detail, hopping from foot to foot and rubbing hands to keep warm...and when early darkness fell, relying on the torch from my phone to check the last vital measurements. The next morning, I went off on a stone-gathering foray to harvest more of the lovely smooth, flat pieces of Gneiss for the entrance floor mosaic. The poor sheep were very disappointed as they hungrily followed me up through the field, little knowing that my large white sack was full of stones!